I recently decided to revive the origami-type folded frame with an enclosure for the focal point. Usually the instructions for this frame call for it to merely be folded, which is what I would normally do. But, in this case, I wanted it to look a bit more tailored. To achieve that tailored look, I put adhesive underneath the areas that form the four corners, and just left the center flaps unglued. I like this effect. It seems that the butterfly is emerging from a window set into the background of the card. When I added the beautiful 5/8" Organza Ribbon, my intention was to add some sort of bow. I created a few types of bows, none of which thrilled me. I finally decided that, since that ribbon is so beautiful in and of itself, just the simple strip of it was absolutely perfect. No need to junk it up with a bow that would have detracted from the beauty of the focal point. 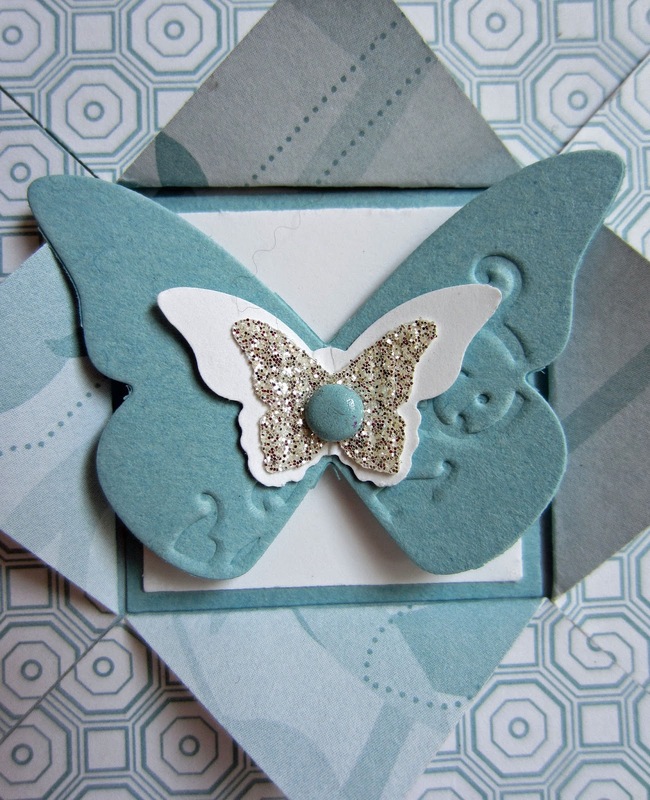 To create the multi-layered butterfly: the blue butterfly is the largest of the Beautiful Wings Embosslits butterflies; the white butterfly is punched out with the Bitty Butterfly punch; and, finally, the sparkly silver butterfly was also made inside the Beautiful Wings Embosslit with Glimmer Paper. I especially love the delicate embossing on the largest butterfly. Don't you? To extend the embossing a little further on the card, I embossed the background with a[n] (unfortunately) retired embossing folder. By gently bending the wings upward, the flying action of the butterfly meshes well with the fluttery flaps of the "window". You have probably noticed that I often omit any kind of sentiment on the fronts of my cards. The biggest reason for this is I think that frequently the card front is enough to stand by itself as a design and something wonderful to look at. I've even been told that my cards are pretty enough to frame. I feel that is because it actually is a miniature work of art. Also, this makes a card that much more versatile. This one in particular can be used for almost ANY occasion. You have the option of decorating the inside to fit the occasion, complete with an appropriate sentiment. I used this card for an anniversary greeting. This is beautiful. I love the dimensional effects. I found you over at the weekend link-up party. That is a pretty card. The butterfly just pops off the card. Beautiful card. Thank you so much for the instructions to make it. I could only wish mine will look anything like yours. But...im sure gonna try. Linda, you have such a wonderful talent! Love it! Thanks for sharing with us at Your Designs This Time! Love this type of frame! So classic! Thanks for linkin up to Sunday FUNday! 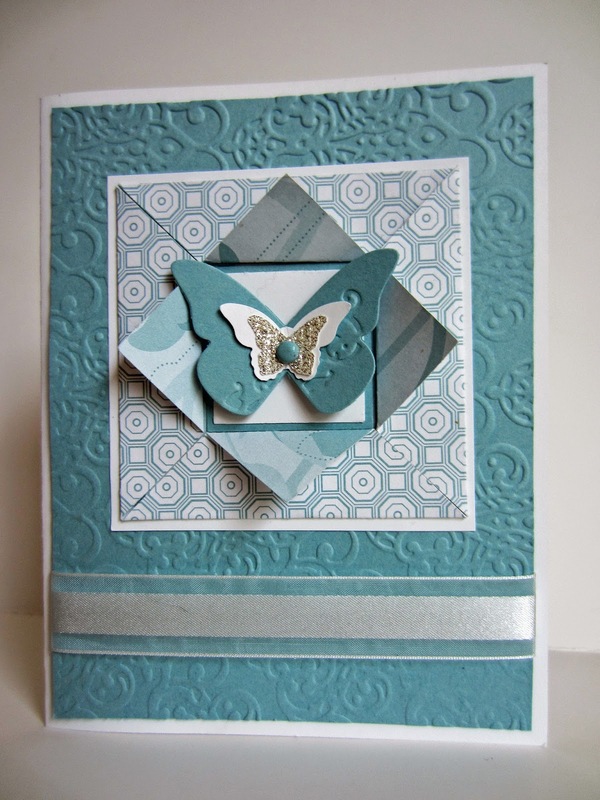 Every time I go through your blog, I have found a new card maker tutorial! Thank you so much dear!